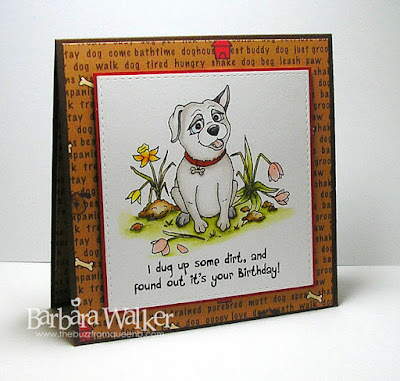 The Buzz: From The Heart Stamps Monthly Challenge ~ Happy National Puppy Day! 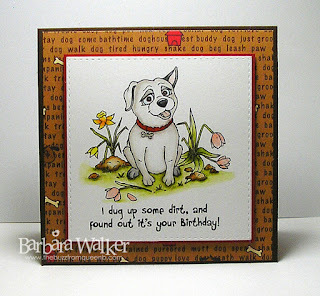 From The Heart Stamps Monthly Challenge ~ Happy National Puppy Day! Hello Friends! It's the beginning of Spring and things are bloomin' and kicking up all kinds of allergies for my peeps! I'm making soup and blending oils and just going in a million different directions. But, I wanted to post this card TODAY! Pretty cute, right? I love that Faith, the illustrator, includes soooo much word art. 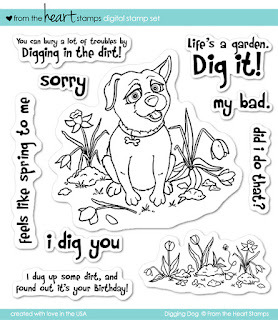 The font is perfect for this set and there is such a great variety of greetings; birthday, spring, love, apology. Here is the card I made. It's pretty simple, but absolutely perfect to share on National Puppy Day! I have had this patterned paper in my stash for years and when I saw the dog digi, I knew I wanted to use it. I printed the image onto Bristol and watercolored it with my Zig Clean Color Real Brush markers. Super simple and lots of fun to watercolor. That's all I have to share today. I hope you are having a wonderful Wednesday! Oh gosh, how fun! Great birthday card images. You've colored everything beautifully and that background paper is indeed a terrific background. Excellent work on this fun and festive birthday card. So happy to "see" you, although I have to say bummer on the advent of allergy season. Hugs!!! 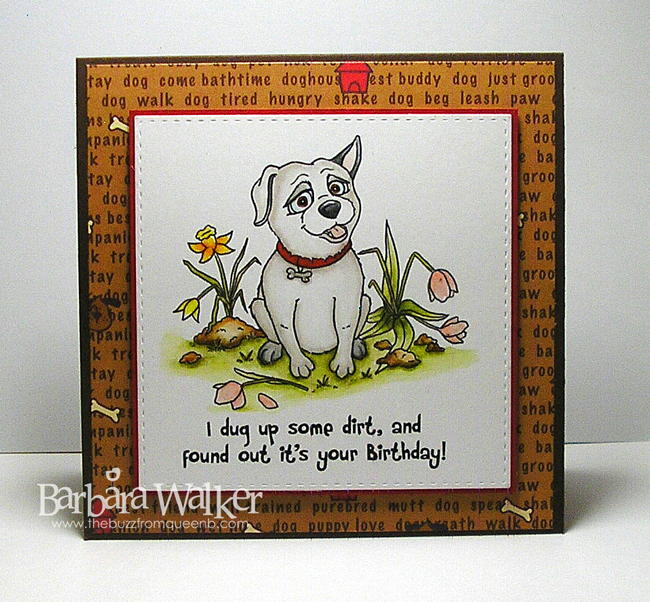 Fabulous card Barb. Really love the background text to support this awesome Stamp of the Month by From The Heart Stamps. Sure glad you joining us this week and we look forward to your participation in April. WooHoo! wiiiii what a gorgeous little puppy! I love your card, it is so cute! Oh, this paper is so perfect! I love that you created an inside too! 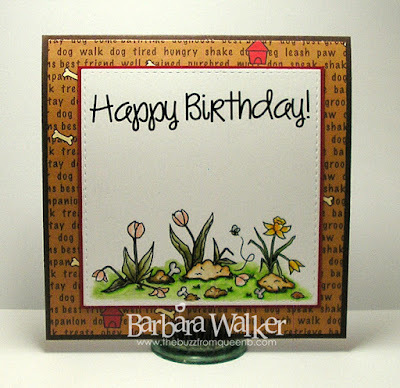 Thanks for playing along with us at From the Heart Stamps SOTM challenge! The patterned paper fits so nicely, Barbara and your card is adorable. Love your coloring and the inside too. 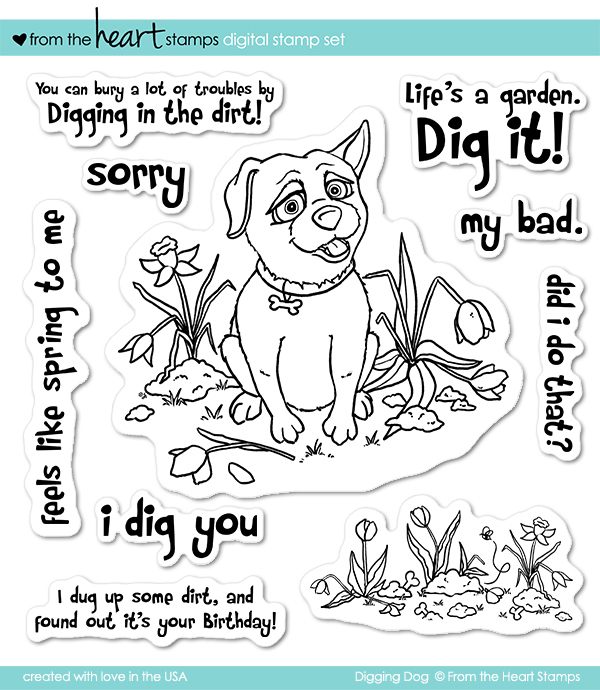 Thanks for joining our FREE Stamp of the Month March Challenge @ From the Heart Stamps !